Tom Moore using the ARK context register in the field. At the 100 Minories project, we collect all of our data using both a paper recording system and also an online database. For this we use the Archaeological Recording Kit (ARK). 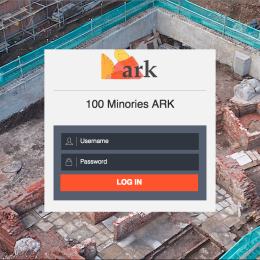 ARK is a web-based ‘toolkit’ for the collection, storage and dissemination of archaeological data. It includes data-editing, data-creation, data-viewing and data-sharing tools, all of which are delivered using a web-based front-end. What this means is that when we record things on site (buildings, pits, postholes, etc.) they are put directly into the ARK (using iPads on site) – and can immediately be seen via the web by anyone who is interested in following along with the project. Click here to view the live data from the 100 Minories ARK. 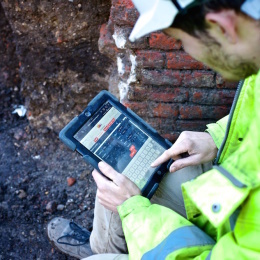 Click here to read more about the Archaeological Recording Kit open source software.